Nearly 2,000 mechanics in the Chicago area have been on strike since Tuesday over work hours. 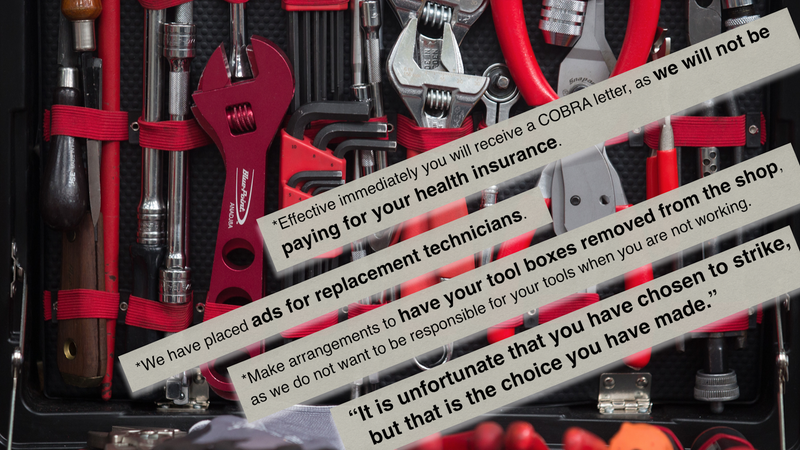 Letters allegedly sent by more than one dealership informed employees of the “consequences” of striking: a discontinuing of their health insurance, hiring ads for their jobs and, in one case, tools being put outside. One letter was originally sent to Jalopnik by more than one emailer, all of whom saw the posts circulating in different Chicago-area automotive Facebook groups. Those who posted various photos of the letter claimed it was sent to employees by Napleton Cadillac in Libertyville, Illinois, in response to the area-wide strike including more than 100 dealerships across different brands, in which Napleton Cadillac allegedly said it would be doing the above to employees participating in the protest. Photos also circulated of toolboxes sitting outside, on a rainy day, of a dealership that closely resembles images of Napleton Cadillac. A similar letter was later posted on Facebook by another user, claiming that his cousin worked at the Illinois-based Cadillac of Naperville. The post alleges that the Naperville dealership, which is not under the Napleton umbrella, sent an almost identical letter to its employees. *Effective immediately you will receive a COBRA letter, as we will not be paying for your health insurance. You will be responsible for the premiums in their entirety. *We have placed ads for replacement technicians. If and when you are replaced, you will be notified. After you are replaced, should you make an unconditional offer to return to work you will be placed on a preferential hire list should an opening occur. *Make arrangements to have your tool boxes removed from the shop, as we do not want to be responsible for your tools when you are not working. It is unfortunate that you have chosen to strike, but that is the choice you have made. In addition to work hours, the strike, which affects around 130 of the 420 new-car dealerships in the area, is over the union’s claims of scheduling issues, harsh pay structure discouraging young people from joining the field and the inability to move up or achieve a long-term profession. Automotive News reports that Automobile Mechanics Local 701 has been negotiating since June with a committee that represents dealerships. The most recent offer from dealerships was a three-year contract promising a pay raise of 5 percent annually, but Automotive News reported that the deal was “overwhelmingly rejected” by mechanics in the union. The main thing the mechanics want is a guaranteed 40-hour work week, Automotive News reports. Jalopnik has also reached out to the union, and left a voicemail message for its directing business representative, Sam Cicinelli, on Friday afternoon. The call has yet to be returned. While Jalopnik has yet to hear back from an employee, we checked on one of the claims in the letter—the job openings. The alleged letter said Napleton Cadillac had “placed ads for replacement technicians” as of August 1, and, regardless of the validity of the letter, that appears to be true. Posted “two days ago,” as listed on the website, Napleton Cadillac had job listings on CareerBuilder.com. Here’s the description, which made sure to say the dealership “has immediate openings for Automotive Technicians at all skill levels.” Chosen candidates can “start working today,” it says. There’s also a group of photos being passed around on Facebook of the alleged letter and actions by Napleton Cadillac. This one came from a Chicago group, and its poster requested to only be identified by his first name. Therefore, Jalopnik is not linking to the original Facebook post in this article. Joe Schubkegel, his father, commented on his son’s post to reiterate that he collected those tools for more than 35 years, and said they were worth more than $100,000 altogether. “I did nothing to these people and they treat me like this,” he said. While these remain allegations, the photos of tools outside of a shop are similar to Google Maps images of the Napleton Cadillac dealership. The arrows going in and out of the shop area appear in both the photo and the aerial view on Google Maps, and the street view has a similar layout. The street view, below, says that it’s from May 2012. That would explain the lack of a repave and yellow arrows, but the image is being included below because the fire hydrant appears to be in the same spot as in one of the images showing the toolboxes. Jalopnik has reached out to the Naperville dealership, and an employee there said he would have one of the company’s executives call back for comment. We will update this post when that occurs. This story will be updated as soon as Jalopnik is in contact with anyone close to the matter. Update, Aug. 7 at 10 a.m. ET: Jalopnik received an email with a photo of a paper letter that appeared to be the union’s response to Napleton Cadillac of Libertyville’s alleged actions, and confirmed with a spokesperson at the union that it did come from Local 701. The 701 letter said those on strike from Napleton Cadillac were union members, whereas Napleton’s response to the situation was that they were not. The letter also talks about the technicians’ fight for the Standard Automotive Agreement, which essentially lays out fair practices for employers and mechanics—base and overtime pay, training, holidays, tool insurance, assignments and the like. More about the agreement and its contents can be read here. The Fixed Operations Director, who has a relationship with the Union at other Napleton stores, after a period of time bargaining with the Union informed the Union that Napleton has no problem signing the Standard Automotive Agreement when that Agreement gets resolved. Their attorney then guided the employer in a different direction as he wanted to continue to negotiate other turns. This turn indicated to the Union as well as the technicians that the employer has no intention towards an agreement. The Standard Automotive group then went on strike. The technicians, upon hearing tht the Standard Automotive technitions decided to go out on strike, coupled with the news about the unwillingness now to agree to the Standard Automotive Agreement, decided they too would go on strike as they were tired of the games being played by the company and the attorney. In a retaliatory manner, Napleton management took exceptio nto them stiriking and informed the Union at 4:00pm that wehave until the next day at 10:00am to get the technician’s [sic] tool boxes [sic] out. This demand is imply unachievable. As the deadline neared he began to push out the toolboxes. The manager was then notified by the Union that the company would be held liable should anything happen to their personal belongings. The letter ended by saying that each toolbox is now at its technician’s home while they all continue to strike. Thanks for the tips, Mathew and Jordan!